Their equipment offer protection against the blazing sun, dust, and sand, and it helps them tell friend from foe in the heat of battle. The Spider Shield offers good defenses and has excellent poison resistance. In the Valley of Drakes, the Brigand Set can be found on a bridge filled with Blue Drakes, right at the main entrance to the lost human city of New Londo. The environment in the Valley and outside New Londo can be considered mountainous and harsh: this could be the area were the bandits operated, as it grants the ability to travel quickly between interesting points for them to raid, such as New Londo, Blighttown, Darkroot Garden, and so on. 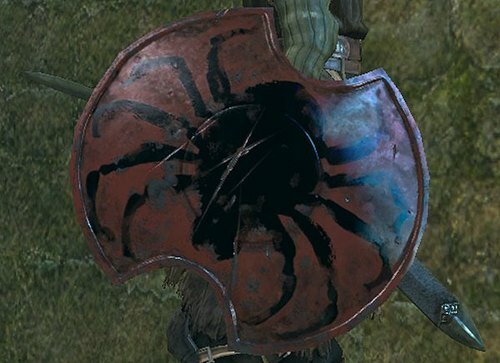 Their Spider Shield also grants the bandits with a incredibly high poison resistance, hinting possible attacks at Blighttown, or at The Depths. Regarding this last area, it's important to note the presence of a corpse holding this Spider Shield, and near it, a giant rat, with an axe embedded in its left eye. It looks like a bandit died fighting the rat, half-blinding the beast. The Spider Shield bears the shape shape of a ten legged spider. This could be a reference to the Tsuchigumo, a derogatory term used in the ancient Japan for renegade local clans, seen as "outlaws". The relation between a bandit and an outlaw is very narrow. Alternatively, Tsuchigumo is also the name of a spider-like race of Yōkai (spirit), who wore giant outfits, had the face of an oni, the body of a tiger, and the legs and arms of a spider. Those were said to have lived on mountains. 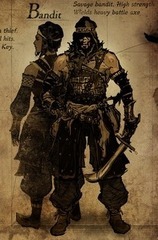 Coincidentally, Bandits also lived in mountainous regions, so the relation gets even closer. Uniquely-shaped with a large black spider etched upon it. Worn by the brigands who raid mountain hamlets and attack travelers. it helps them tell friend from foe in the heat of battle.